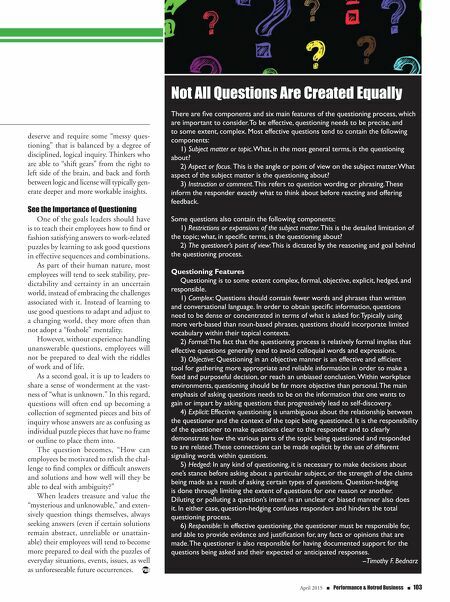 102 n Performance & Hotrod Business n April 2015 PRECISION ENGINE BUSINESS The Importance of Questioning A simple path to greater understanding. n BE A LEADER By TimoThy F. Bednarz W ithin the workplace, leaders need to emphasize the importance of questioning, and can do this by welcoming all those "why" and "how" questions, and asking a lot of them personally as well. Routine, rigidity and tight boundaries tend to snuff out the questioning process before it begins to achieve any glimmer of light, hope or momentum. Leaders need to be content with leaving many questions unanswered, and by so doing, create a collection of unknown working elements that offer evidence to the prominent place that curios- ity holds within the organization. Leaders can use questions and answers to make the employees' work life and environment curious and exciting. To do this, questions should mirror employees' sense of adventure, interest and curiosity. Observing and questioning their world of work helps to establish an outstanding and superb sense of teamwork. Avoid Excessive Routines Organizational cultures often hin- der the attainment of positive work- place growth and development when they tend to allow, incorporate, or spread a bland veneer of "sameness" or a status quo of "apathy" throughout the working environment and work- place landscape. Faced with a bland, dominated working landscape, it is up to leaders to find ways to liberate their employ- ees from the continuous shaping of ideas, opinions and the peer pressure of "sameness." Employees can be freed from these organizational culture con- straints by becoming good questioners. When employees are surrounded by leaders and supervisors who pro- vide immediate, simplistic responses to all the questions they ask, a false impression is created that emphasizes a culture where "answers do not require serious thought or ingenuity." Employees are prevented from observing firsthand how initial ques- tions spawn additional ones, which eventually lead to fresh answers. As a result, they tend to lose out on the opportunity to experience mind- searching, analyzing and decision making. Q&A as a Puzzle Working environments tend to present an endless supply of puzzles. The only problem is, many employees spend most of their time and lives avoiding puzzles and serious questions. Yet, if every question has a quick and easy answer at your company, then the purpose of inquiry is lost. Puzzles within the mind tend to arouse a sense of curiosity and stimulate questioning. While some employees may be bewildered when first attempting to figure something out, good ques- tions will start to break up their mental logjam and begin to unlock everyone's frozen thinking, while at the same time setting them on the path to greater understanding. Puzzle avoidance leads to stagnation. A healthy organization keeps its employees' heads out of the sand and tries to see what is coming in order to be prepared. A proactive group of employees learns to wrestle with difficult questions and predica- ments rather than rely upon recipes and formulas, which may have worked in the past. If leaders provide a continuous menu of work- place puzzles to decipher, employees will develop at a faster pace, feeling confident and resourceful in the process. Ingenuity and skill will grow faster and when confronted by a problem, quandary or an impossible situation, employees will be less likely to be shaken or fearful. Over time, they will actually begin to greet dilemmas as a "challenge and a test of ingenuity." Also, at certain times it is important for lead- ers to make it a point to answer some questions, especially more complex or wide-open ones, with an admission of ignorance or uncertainty. 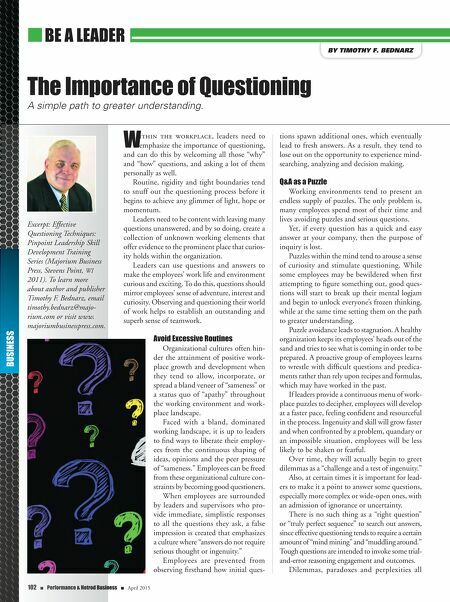 There is no such thing as a "right question" or "truly perfect sequence" to search out answers, since effective questioning tends to require a certain amount of "mind mining" and "muddling around." Tough questions are intended to invoke some trial- and-error reasoning engagement and outcomes. Dilemmas, paradoxes and perplexities all Excerpt: Effective Questioning Techniques: Pinpoint Leadership Skill Development Training Series (Majorium Business Press, Stevens Point, WI 2011). To learn more about author and publisher Timothy F. Bednarz, email timothy.bednarz@majo- rium.com or visit www. majoriumbusinesspress.com.